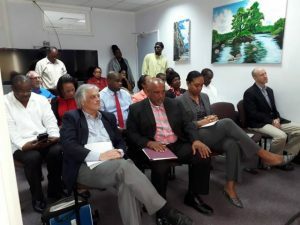 The International Organization for Migration (IOM) has handed over eighty core houses to citizens of Dominica who were affected by Hurricane Maria. The homes were officially handed over at a ceremony held this morning at the Financial enter. The project dubbed the ‘Early Recovery Shelter Support Project,’ was implemented by the IOM with funding from the Government and people of Australia. The Australian High Commissioner, John Pilbeam, symbolically handed over the 80 completed resilient core houses to a representative of the Government and people of the Commonwealth of Dominica, during the ceremony. This Early Recovery Shelter Support benefited two hundred and nine individuals in eighty families in twelve communities across Dominica who were identified as vulnerable according to the criteria agreed with the Ministry of Social Services, and who had lost their homes, or whose homes were too weak to be repaired.